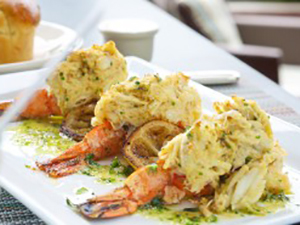 By filling the shrimp with a crabmeat stuffing, Smith & Wollensky can menu a signature item that contributes high-quality protein in a more price-conscious package. Zest lemon and squeeze juice. In mixer fitted with paddle attachment, combine butter, lemon zest and juice, roasted garlic and salt and pepper to taste; mix until fully blended. Transfer garlic butter to plastic wrap; form into a log shape and chill. In large bowl, combine mayonnaise, egg, egg yolk, chives, mustard, seasoning and cayenne; mix well. Season with salt and pepper. Gently fold in crab and mix until lightly blended. Cover and chill until mixture is firm. Make a small slit on the inside of each shrimp. Flip over and split open the back side of each shrimp, forming a pocket for stuffing, taking care not to cut all the way through. Form chilled crab stuffing into balls; stuff evenly into each shrimp. Sprinkle breadcrumbs lightly over stuffed shrimp. Cover and chill to hold. For service, preheat oven to 400°F. Per serving, melt 3 tablespoons garlic butter in small ovenproof baking dish or shallow cast-iron skillet; arrange 3 shrimp, stuffed-sides up. Bake in oven 7 to 8 minutes, or until shrimp are cooked through. Transfer skillet to burner. Add 3 lemon slices and additional garlic butter, as needed. Sauté briefly to caramelize lemons. Garnish stuffed shrimp with caramelized lemons and chopped parsley.